There is no other tool that can replace an axe. A survival axe will allow users to cut wood quickly, process game, and build a shelter fast and efficiently. Some survival axes come equipped for multiple purposes. For example, some also work as hammers, stake pullers, and saws. They are generally small enough to easily pack and store with camping or hunting gear. Many can also be carried on the user, so the axe is within reach when needed. When you are out in the wilderness camping or hunting, a good axe is a must have item. When buying an axe, it is important to remember that not all axes are made the same. A high-quality axe will do everything and will last a lifetime. Poor quality axes might break easily, the head may separate from the handle or the handle may split or crack while in use. Poor quality axes may also need constant sharpening. There are two parts to an axe; the head and the handle. The head is the sharp part of the axe used to split and cut. 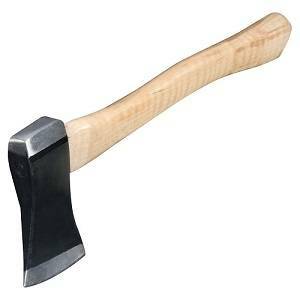 A quality axe head is a single forged piece of steel that is securely attached to the handle. Some heads are forged as one piece with the handle to eliminate the possibility of the two separating. The handle of the axe is traditionally a straight grained piece of hickory wood. However, some newer axes now have handles made of metal or fiberglass. Most of the axes listed on our top ten list do not have hickory handles. While hickory handles are very high-quality, they are also weightier than other options. Regardless of what they are made of, the handle of the axe is strategically shaped so that with each swing, the full force of the axe head is going into what is being chopped. The handle of the axe should be slightly curved giving it that full-force power. It should also be smooth and comfortable to hold. The smoothness and comfort of the handle will decrease the chance of causing blisters. There are several different types of axes. However, the most common survival axe is the hatchet, which is also referred to as a camp axe. This type of axe is generally 1 to 1.5 pounds with a handle that is 10 to 14 inches long. Its smaller size makes it easy to carry it around, store in a camper, or pack in a bug out bag for emergency shelters. It is important for consumers to know ahead of time what they will be using the axe for in order to really get the best axe for them. Knowing the intended use will determine whether a shorter or longer axe is needed, the perfect blade size, and composition. These factors impact how easy the tool is to use, which is important depending on whether the consumer is experienced chopping wood or has never done it before. The weight of the axe may also be a significant factor. If the axe is just going to be used for chopping wood at a camp site, the weight doesn’t matter as much because it will simply be stored when not in use. However, if it is being used by hunters, backpackers, or survivalist, who are going to be more likely to carry it around on their body, the weight will matter. When buying an axe, it is very important to focus on the intended use of the axe. Which category of users was it designed for? While an axe designed for a survivalist may look sleeker and better, it is going to cost more and the difference in design won’t help the recreational camper. There are many really high-quality survival axes to choose from. 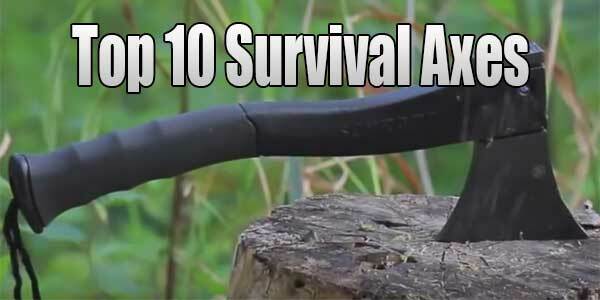 The following is a list of the 10 best survival axes that will get the job done and last a long time. Each of these axes are designed to be efficient to make any job as fast as possible. This camp axe from SOG features all the latest technology in axe design, which makes it extremely versatile and attractive. It has a 3.4-inch straight edge steel forged blade, which is larger than many axe blades. The one-piece design makes it impossible for the axe head to separate from the handle, which is one of the most common ways an axe breaks during use. Having the axe head suddenly separate is extremely dangerous as it may go flying through the air. The handle is designed to increase the power and impact of each strike. It is also rubberized to provide a soft and solid grip. 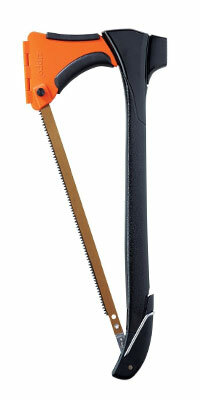 The rubberized handle makes this axe stand out among its competition. Users won’t have to worry about the axe slipping or getting blisters from extended use. It comes with a hard sheath for safe storage. It is somewhat heavier than other camp axes at 2.1 pounds. Although this isn’t heavy, it is heavier than the options. The heavier the axe, the harder it gets to use for long periods of time. It is competitively priced within its niche. The Gransfors Bruks Outdoor Axe is a very traditional axe. It has a 14.75-inch hickory wood handle. The handle is one piece and hickory is extremely strong, so it is unlikely to break. Axe handles are traditionally hickory and most other kinds of axes still have primarily hickory handles. The face of the head is 1.5 inches, which is fairly smaller even for a camp axe. The smaller head means there will be less wood being struck with each blow. However, the smaller head also makes it easier to store and pack. The head weight is 1 pound, so it is very light and easy to carry around. 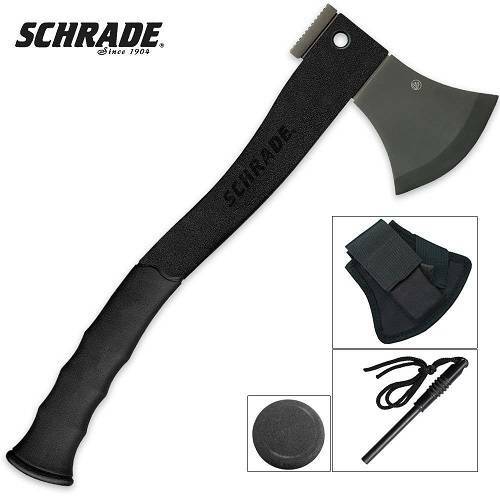 This axe also comes with a full grain-leather sheath, so you can safety pack it in with other camping or hunting supplies. This axe is a bit on the expensive side, but is a very high-quality piece, and will last a lifetime. Depending on what the intended use will be for the piece, this is a highly rated option. This outdoor axe is most ideal for recreational campers that will be using it primarily to chop small to medium sized longs. It is not as versatile as other options, so the usages of this tool are limited to basically chopping and splitting wood. 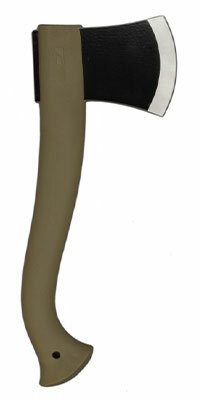 This tomahawk is specially designed to have multiple uses, and is highly rated among survival axes. The full length of the T-Hawk is 13.75 inches, which includes the head, so it is noticeably smaller than many other axes. The head is forged to act as both an axe and a spike. The spike is on the opposite side of the head from the blade. It is sharp and pointed, which makes it usable for breaking things. The entire Kangee T-Hawk is a single forged piece of steel, so the handle and head are literally one piece. This provides a higher level of balance and strength. It also makes the axe nearly indestructible. It comes with a sheath and buckled strap, so you can safety store it and carry it on your body while you are out in the wilderness. In addition to traditional tasks, this axe is also specially designed to be used for self-protection. It’s small, light frame, one-piece construction, and spike end allows owners to use it as a weapon is the need arises. This makes it truly a survival axe. The buckled strap allowing users too easily and comfortable carry the axe on their body also makes it perfect for survivalist. The uses of this tool are nearly unlimited, and it is a preferred option for serious hunters, survivalist campers, and those living in the wilderness. This axe features an all-steel construction. Being forged from one piece provides more strength and makes it practically impossible to break the axe while chopping. 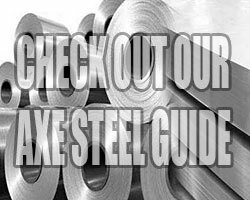 While steel heads are most common, steel handles are not so much. The all steel design gives it a unique industrial look. It is 14-inches long, so it is comparable in length to many other options. Its cutting edge is 3.25-inches, which is larger than many other camp axes. This provides more exposure with each chop making the job go faster and with less work. It also allows the user to chop and split larger logs. The handle is polished and features a genuine leather grip making it very visually appealing. In regards to design and appearance, this is one of the best looking axes on the market. It also comes with a genuine leather sheath making it safe and easy to store while still maintaining the visual attractiveness of the tool. The look of this Estwing axe makes it a great gift idea for men that are hunters, campers, or commonly engaged in outdoor activities. It is sleeker and more attractive than most while still being incredibly versatile. It is highly rated among users and reviews of the tool include the fact it is incredibly strong. The Zippo 4-in-1 Woodsman takes all-purpose tool to the next level. This piece features a camp axe with a full tang stainless steel blade, two rugged wood saw blades, a tent stake mallet, and a tent stake puller. The axe handle is a polymer handle that includes storage for the saw blade. The saw blades feature Zippo’s patented tension compensator that works to ensure perfect tension on the blade every time. They are perfect for sawing through larger pieces of wood, so they can be chopped. Any survivalist can quickly build an emergency shelter using this tool. Due to the additional features, it is heavier and longer than most survival blades. It is 2.6 pounds and 21 inches long. Despite the larger size, it provides the most options. It is less likely to be carried by the user on a belt or strap, but it is still small enough to be packed and stored with other supplies. Despite the additional features, it is still competitively priced in the $50 range. 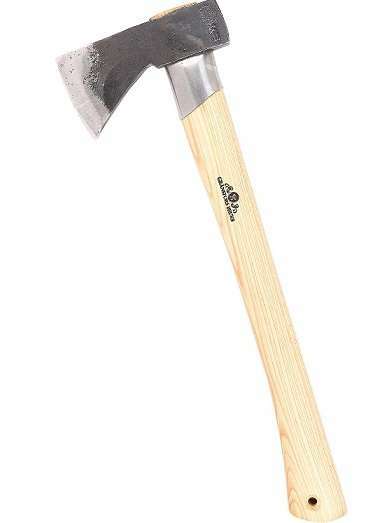 While this axe is most ideal for campers and outdoor enthusiasts, it can also be useful around the house and yard. Simple yard or landscaping projects can be completed much faster and without the need for multiple heavy tools that need stored. This particular axe has a 14-inch handle that was specially designed to be both comfortable and powerful. 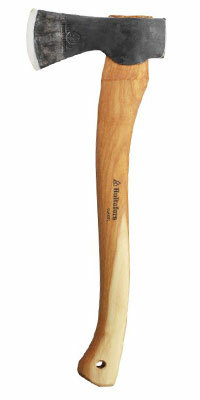 Fiskars designed this hatchet with hikers and campers in mind. It is most ideal for quickly chopping small to medium logs. It is perfectly shaped and balanced to get a clean split every time. In testing, it showed to cut faster and deeper than most traditional axes. The handle is made of FiberComp, which is argued to be stronger than steel. The handle is designed to never break, and it won’t weaken with age. It features a PermaHead insert-molded head that will not loosen or fly off while you are chopping. The composition of this axe demonstrates the latest material options and technology. 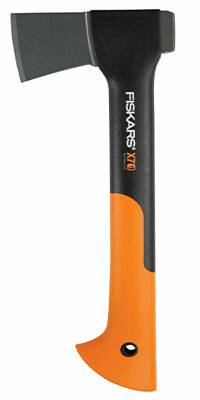 Fiskars X7 is very popular among consumers and has favorable customer reviews. It is also relatively less expensive than many other survival axes, which provides a clear advantage for many consumers. Fiskars is a very reputable brand in all types of cutting tools. The stainless steel head is titanium coated making it even stronger than normal. The back of the axe head features a hammer pommel making the axe more versatile. This eliminates the need of having to carry a hammer or tent stake mallet. The hammer pommel can be used to complete all sorts of tasks including building a shelter. It has a black fiberglass filled handle that is ergonomically designed for power. This type of design means the user can get a solid hit without the same amount of muscle strength required with other axes. This makes chopping jobs go faster and easier because it will take less chops to get through the wood. The handle also has a black rubber grip to give the user maximum control while chopping or hammering. The handle of this axe was specially designed to be as user-friendly as possible. It will no cause blisters or cause the user to lose their grip and lose it while chopping. The total weight of this Schrade axe is 3.2 pounds, which makes it heavy for a camp axe. However, the hammer pommel adds significantly to that weight, so it is important to determine priorities when choosing an axe. If the hammer option is considered a clear advantage, then the increased weight is a minor disadvantage. The handle is only 6.8 inches long, which makes it significantly shorter than most other camp axes. This makes it much easier for someone to carry on their body. It also makes it more compact for packing and easier to handle. The smaller size also makes it easier for many to handle. This is especially true for those with less experience using an axe. The head of this axe is boron steel coated in black epoxy. The blade is 4.5 inches long, which makes it longer than most others. The larger the blade, the more wood will be hit with each chop. This allows the axe to be used on larger logs that smaller axes couldn’t handle. The axe itself is 12.6 inches long, which is short for a camping axe. Most camping axes are 14 to 21 inches, but the smaller size isn’t necessarily a disadvantage. For many it may be considered an advantage. While the blade allows it to be used on larger logs, the short size makes it easier to handle. The handle is made of reinforced plastic. Reinforced plastic is solid and stronger than most plastics. However, it is not as strong as steel or fiberglass. Being that it is somewhat weaker and not forged one-piece with the head, the chance of this axe breaks is higher than others. It comes with a leather sheath and a limited lifetime warranty from the manufacturer. This axe weighs just over 1 pound, which makes it significantly lighter than the other axes, which makes it easier to carry in a backpack. 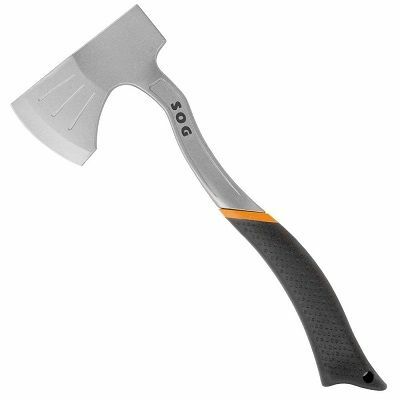 Based on the features of this axe, it is most ideal for recreational campers. The reinforced plastic handle means it won’t be as durable for heavy usage. The shorter size and wider blade make it easier on the users and perfect for the inexperienced user. It is for these reasons it is most ideal for the recreational camper. It is also on the low end in regards to price, so it won’t be a significant investment for someone that will only be using it occasionally. 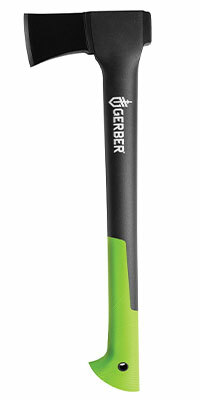 The Gerber freescape hatchet has a very rugged design. Just looking at this axe makes it clear it is ready to work. Gerber designed this axe with military, hunting, survival, tactical, and industrial situations in mind. They wanted it to be versatile and durable. All Gerber products are field tested to ensure their high quality. Consumers can be sure that the axe will perform all the needed tasks at a highly acceptable level. 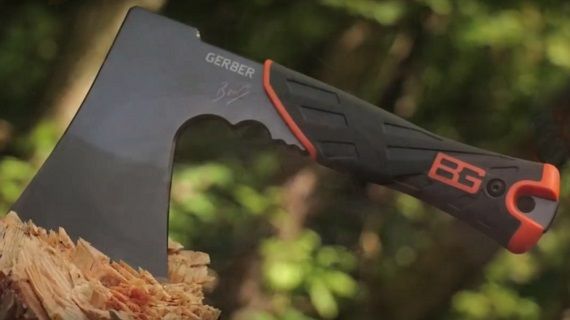 Field testing the axe helps Gerber maintain the highest quality possible. The head is forged steel, and the handle is a composite made to be both lightweight and highly durable. The handle is molded with a soft-touch design, which makes it easier and more comfortable to use. 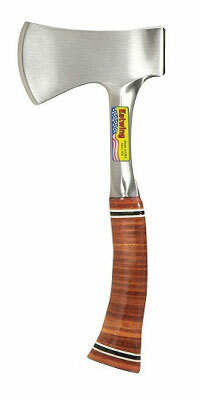 Composite handles are becoming more common for camp axes, while larger axes still typically use wood handles to take the weight of the axe head. The length of the axe is 17.3 inches long, which makes it comparable to other axes in this category. It weighs 2 pounds which is also comparable with other axes. This is a durable and highly trusted product that can be used in a wide range of situations. Similar to the Gransfors Bruks Outdoor Axe, this axe is has both a traditional look and design. It is made in Sweden and features a Swedish steel head. The weight of the head is 1.9 pounds, which demonstrates it is a good size axe head. The handle is made from American hickory wood, which is the traditional material used for axe handles. Hickory wood is highly durable. It doesn’t crack, splinter, or dry out easily. The axe is 20 inches long, which makes it one of the longer options in survival axes. 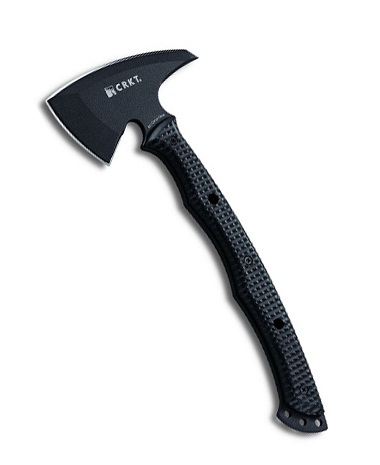 This axe is ideal for recreational campers or outdoorsman. It can also be appreciated by hunters that use it primarily at their campsite. It can also be used for outdoor projects at home. Each of these axes comes with its own advantages and disadvantages. The best option from this list will really depend on the intended use. Some of these are tailored for beginner or recreational campers, while others are designed for serious survivalist. The difference in design also comes down to personal preference. All of these axes are highly rated among customers. They are manufactured by reliable companies that are known within this industry. While some look better than others, they are all structurally well designed to do their job. There is a range of lengths and weights. Lighter and shorter axes are going to be more ideal for hunters, backpackers, and survivalist. Meanwhile, the heavier, longer axes are ideal for recreational campers that are going to use the axe primarily for splitting wood. The axes also vary in price. While most of them fall in the $50 to $60 range. A good axe can be found for as low as $30 to $40 and as high as $150 or more. When researching axes, it is important to have a budget in mind to help narrow the options. Great guide! I love the Swedish axes, they probably make some of the best axes in the world. The best survival axe in my opinion is an axe small enough to always come along on every trip. Very nice guide.The description of the axes was written very well.